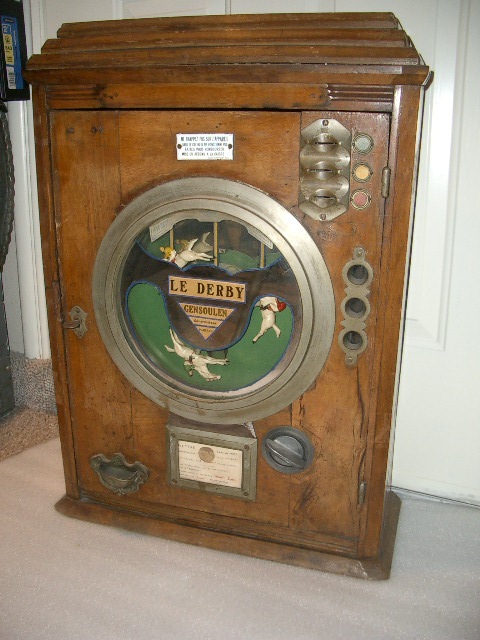 Gambling machine, circa 1920’s French token payout gambling game called LE DERBY. A nice example and they are rare and eagerly sought after by collectors. The machine is a payout horse race themed machine is at the top of the charts. Machine takes a French quarter size coin (25-cent machine). I have included over 100 of the coins with machine. A winner (three coin entrances) rings a bell and pays out a small token (over 100 included). This machine is in wonderful condition and works perfectly. Complete with original lock and key. This is a full size-gambling machine. Dimensions: 27 inches tall by 20 inches wide.